A little rough and tough but gentle enough to be fashionable and so comfortable to wear. 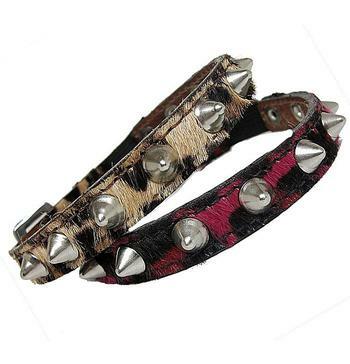 This collar looks great on so many different breeds. 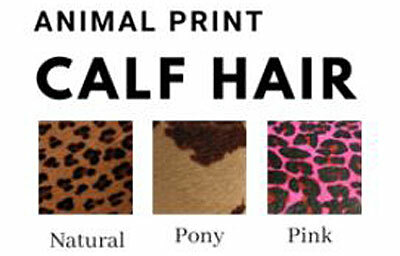 Leopard cat collar with a single row of nickel cones is available in natural, pink calf's hair or print pony. The vegetable tanned leather lining provides years of comfort to make this collar last. All cat collars have a nickel D-ring near the leather loop to hold an ID tag and elastic close to the buckle to provide extra give. There are 5 holes and the size fitting the center hole closed is the size stated. These collars are custom made in New York by skilled artisans. Please measure the actual size of your cat's neck. If the actual measurement is between two sizes, order the larger size. Please be patient and allow our skilled craftsmen time to create this custom made product. Each item is made per order. Delivery is approximately 3 - 4 weeks. 8" x 1/2", 10" x 1/2", 12" x 1/2"